RIDETZ is less than two weeks away!! We have a couple more wonderful, enthusiastic people to introduce who complete 2016’s team of adventurers. Learn about all of the riders before they leave, and then make sure to follow along on our blog for updates on the journey as we post throughout the trip! They take off on June 18th for this once in a lifetime experience. Today, we are thrilled to introduce first-time rider and dedicated supporter of TFFT, Abby Lee! I was born and raised in New Canaan, Connecticut. I grew up there my whole life until I moved to Scotland for four years to received my undergraduate degree in International Relations from the University of St Andrews. 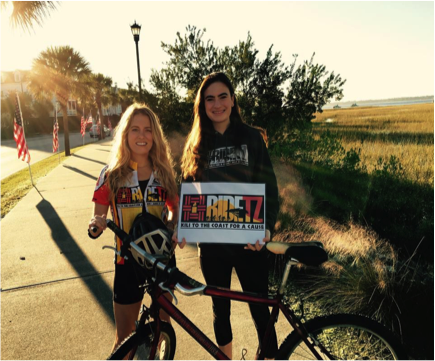 I now live in Charleston, South Carolina with my best friend and experienced RIDETZ participant, Miller Bianucci. Sadly, today was the last day of school for me. 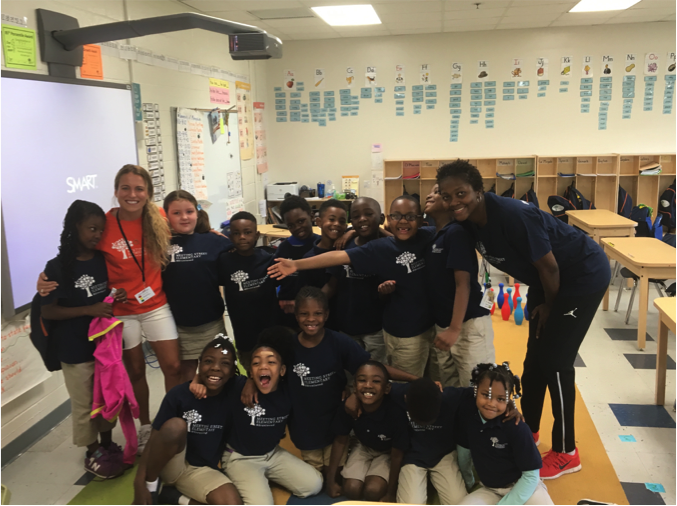 I am a 1st grade teacher at a public charter elementary school in North Charleston that is a model system for US education reform. Meeting Street Elementary at Brentwood is a Title I school, meaning over 90% of my students live in poverty and grow up in grossly under-resourced communities. It has been an absolute joy and privilege to teach my kiddos, but they have also taught me so much more about myself and about the disparate world that we live in. In August I will begin my service in the Peace Corps for 2 years to do Youth Development work in Peru. 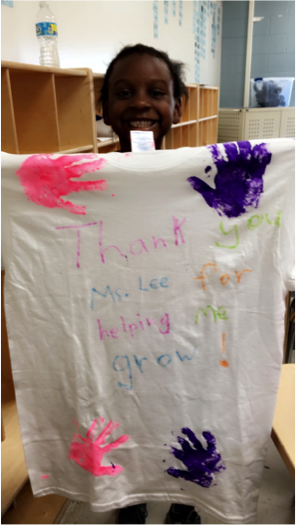 My student, Ka’Miyah, holding a t-shirt that she made me! I love to travel! It is difficult for me to stay in any place for too long and I find it is the most exciting thing to see different people, places, and cultures. I also love to exercise, although I must admit, before I signed up for this trek…biking was not my thing. I played lacrosse in college, I have participated in several marathons and races, and sports have always been a huge part of my life. But cycling has become a new found passion for me, and all because of RIDETZ! 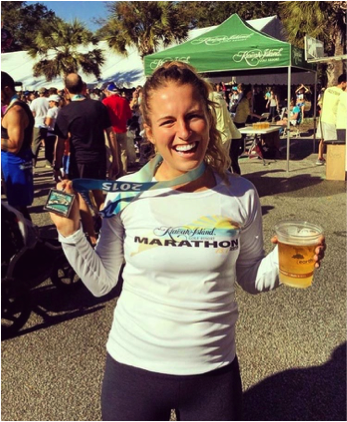 Me running the 2015 Kiawah Half Marathon in support of TFFT! 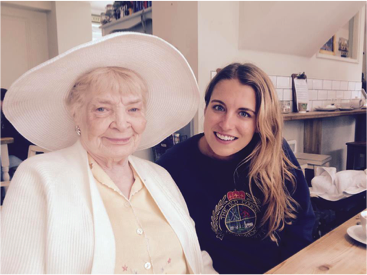 My grandmother is the most inspirational, spitfire that you will ever meet. She is motivated and kind, honest and smart, determined and gentle. She is the definition of fortitude, resoluteness, and what you can accomplish when you set your mind to something. I will be thinking about her a lot on this bike trek, and channeling her strength to get through every day! 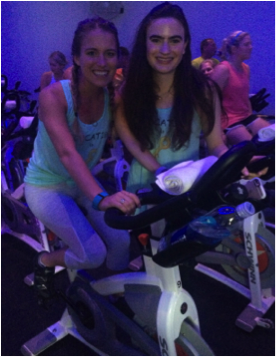 I heard about RIDETZ through my best friend and roommate, Miller Bianucci, whose family has been involved with TFFT for many years. 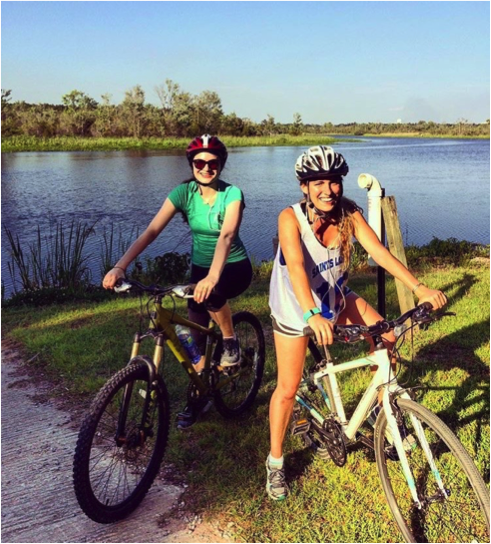 Ever since I met her 5 years ago, she has always talked about this bike ride, how life changing of an experience it is, and how I need to do it. I couldn’t deny how amazing it all sounded, but the act of committing to such an adventure and fundraiser seemed daunting. 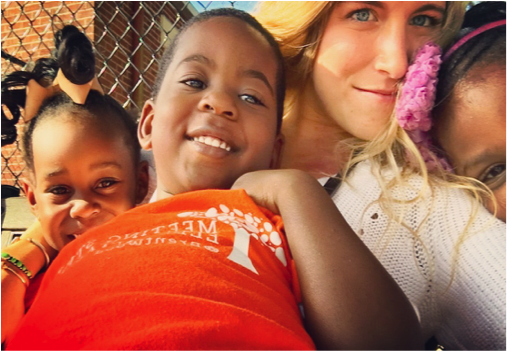 I finally decided to sign up for RIDETZ when I looked into TFFT and how it is changing children’s lives. I wanted to be part of an organization that believes in educational opportunity and love for every child. While I have always been deeply inspired by RIDETZ, what truly motivated me to sign up was realizing that I might not have another opportunity to bike 400 miles across Tanzania for a cause that is so close to my heart. I knew this would be an experience of a lifetime, but I also felt that the work that TFFT does is so crucial and I wanted to be able to help support some of these orphaned and vulnerable children’s lives. At my school, I see everyday how education is the fundamental tool for empowerment, self-esteem, and hope. I know the immense potential of my inquisitive and bighearted students, and it has opened my eyes to how truly blessed we are to receive an inspiring and meaningful education. I passionately believe that all children deserve this, no matter what circumstances they are born into. TFFT effectively and holistically provides Tanzania’s most vulnerable youth with the opportunity to expand their horizons, contribute to society in a meaningful way, and to become leaders. This organization believes in the power of education and that geography should not dictate an individual’s potential. It is through my belief in TFFT, my commitment to these orphaned scholars, and my conviction in their endeavors toward academic achievement, that I will be able to tackle this 400-mile bike challenge! First time traveling to Tanzania!!! First time competing in long distance bike race!!! First time experiencing RIDETZ!!! 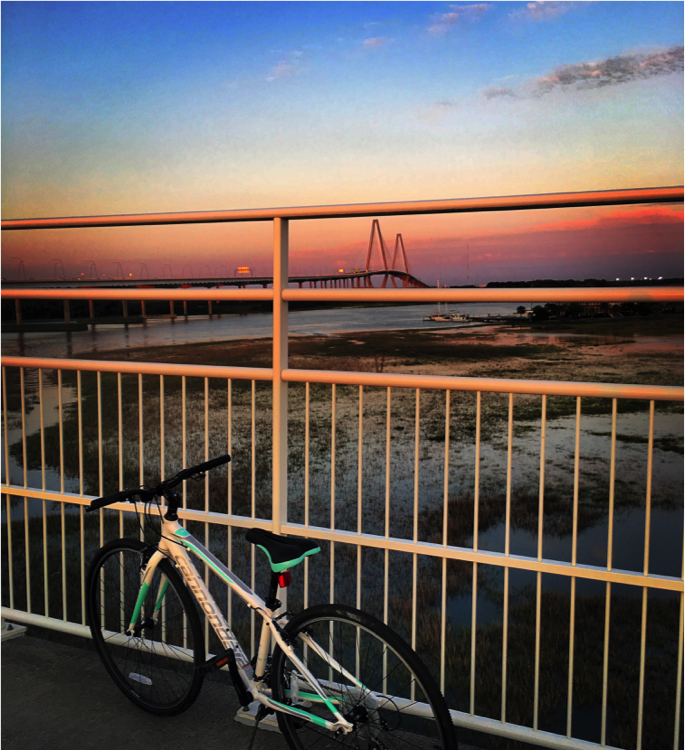 My favorite place to ride is the Cooper River Bridge in Charleston, SC. It has a lot of significance to me because I ran it in order to fundraise for TFFT and it has now been the site for most of my training. Hills are few and far between in Charleston, so the Cooper River Bridge helps fulfill that void. The views aren’t so bad either!